(*) The warranty applies to goods purchased on or after 1 October 2016. If contact is made with an obstruction while moving, the opener either stops or reverses the door to reduce injury to persons and damage to property. Ramping speed up and down at the start and end of each cycle reduces stress on the door and opener for longer life, and makes for quieter operation. Every door and gate is unique, and each needs amounts of force throughout each open and close cycle. The amount of power needed for your door or gate is learned during setup and is constantly re-profiled. This helps ISS to do its job. DC motors deliver as much power as old-style AC motors but with less noise and vibration. DC also offers features such as Soft Start/Soft Stop. Suitable for applications where side room is limited, Slim Fit requires as little as 40mm between the door curtain and inside of the bracket. Auto-Close ensures peace of mind and keeps your home secure by automatically closing the gate upon entering or exiting the property. Allows you to set up a limited opening height for your door, ideal for airing your premises on hot, summer days. Locking out all but one master transmitter, Vacation Mode ensures your gate opener cannot be operated until you return. The Auxiliary Mode can activate other devices, such as an existing garage door opener or alarm system, from your new TrioCode™ transmitter. High efficiency LEDs provide a whiter and brighter light to illuminate your garage, feature a dimming function, and can be programmed to stay on for differing lengths of time. The opener is compatible with the new Wireless Safety Beams system, making installation of this important safety device easier and neater. Charging from the mains, the optional battery backup switches over automatically in the event of power failure. 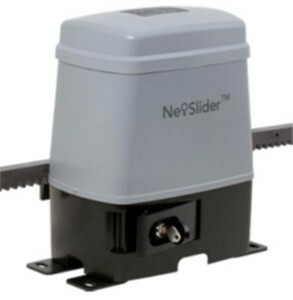 The optional SmartSolar Ready kit allows for installation on unpowered sites, or for green-friendly operation.